Being the town eclectic (i.e., “artsy” person), I spontaneously asked my coworkers to dress like bees in celebration of National Honey Bee Day. I was surprised when they actually did. Next, I was shocked when my Save the Bees Fest was a success. And then I was humbled when the Clay Town Board voted unanimously to approve my proposed hive community (read: can I get bees?). After a dear friend recently made a big move to Saulgé, France, she randomly mentioned that her new town kept bees. But that tiny exchange was enough to light a spark. I am a big believer in the idea that whimsy breeds knowledge, and have used this concept in my recreation-program design and implementation for 25 years. Very rarely will you find me creating a program without using the disciplines of movement, music, creative dramatics, visual art, and costuming to introduce a central theme. 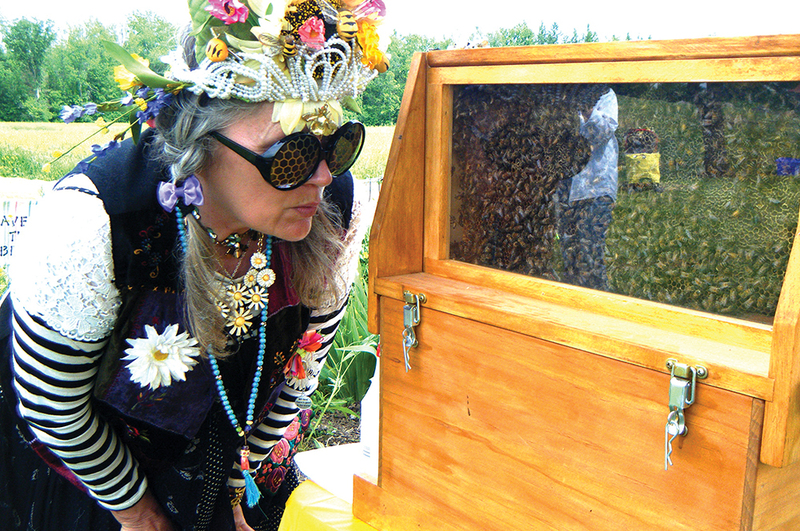 As a storyteller, I have always been intrigued by the folkloric concept of telling the bees—the tradition in which the bees are always informed of important events. It intrigued me to think that my friend was lucky enough to have bees right there in her town. She could tell them everything! And, so, (you know I have to say it …) with a bee in my bonnet, I was off (more off than usual, if you ask around). I began to research bees. I started by coordinating a bee party for the senior citizens. This turned out to be such a success that I offered a town-wide Save the Bees Fest, complete with hands-on bee projects, an observation hive, bee-centric vendors, music, a beekeeping-education area and, the favorite of the day—Tea with the Queen Bee! And, although I was learning and researching extensively, I needed professional help. Looking into local apiaries, I had the good fortune to partner with beekeeper Ken Boyce of Chittenango, N.Y.
85 percent of plants exist because of bees. And some alarming statistics: In the state, annual loss of beehives has been 40 to 50 percent over the last several years. The cause for their demise includes lack of forage, pests and diseases, and pesticides. The more I read, the more I realized I had found my mission. Shortly thereafter, in the midst of doing all my fun bee parties, I stumbled upon a swarm of bees on a sunflower in the community gardens I coordinate. It was simply a breathtaking sight. I figured that was a message from the bees. The bees were telling me! At that point I decided to ask the town for an apiary to enhance the current Project Green community gardens. With the backing of Boyce as my professional apiary support, we designed a program of awareness, education, and action. Legal, liability, and insurance-related issues needed to be addressed while designing the program, as well as important signage, statistics, and general benefits to the community. We were finally prepared to present our program to the town board. The result was a unanimous yes vote, for which I am truly grateful. And so, there I was, ready to install my new hive community—just like that! The bees came to live with us on June 9, 2018. We held a Bee Science Fair that day and ended the event by installing Queen Melissa (yes, of course I named her) into her new home. I’m overwhelmed to think that my friend’s simple comment, subsequent support, and embrace of my crazy notions, all the way from France, have had such an effect on our bees. Because of the Saulgé town bees, we will now be bolstering the town of Clay’s bee population. We’ll be advancing bee education. The bees will be supporting biodiversity and local gardening initiatives and will become a natural inspiration for residents to act as stewards for the environment. Our whimsy will breed awareness and knowledge. And all because, across the globe—we tell the bees. Town of Clay Project: GREEN Community Gardens. Ken Boyce has been a beekeeper for the past 18 years. He is past president of the Mid York Beekeepers Association and a member of the Syracuse Beekeepers Club. 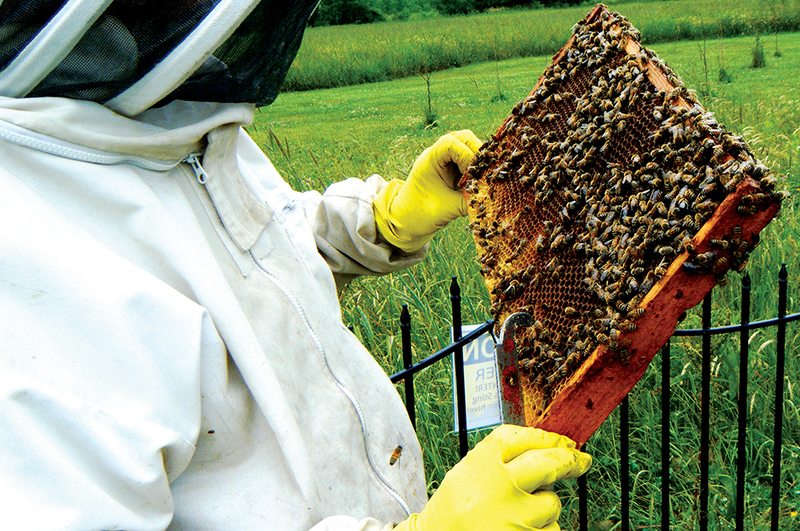 He helps teach the beginning and advanced beekeeper courses at Cornell Cooperative Extension.